Lisa Curtis, the head of conservative Heritage Foundation's South Asia Program analyses the Obama visit to India in conversation with rediff.com's Aziz Haniffa in Washington, DC. Lisa Curtis attaches more importance to United States President Barack Obama's unveiling of measures like easing of export controls on Indian organisations and support for India's membership in global nonproliferation regimes than his endorsement of India's bid for a permanent United Nations Security Council seat. Curtis, a former Central Intelligence Agency analyst and senior Congressional staffer who worked on the Republican side of the Senate Foreign Relations Committee, said Obama's endorsement of India in the UNSC was a calculated move. Click NEXT to read the full interview.. Beyond, of course, the major symbolic significance, are there tangible gains that India can expect from America's support for its bid for a permanent UN Security Council seat and Washington's support for Delhi's inclusion in the global non-proliferation regimes? Obama's endorsement for India to obtain a permanent seat on an expanded UN Security Council was a diplomatic gesture to demonstrate the US fully backs New Delhi's rising influence and stature on the global state. In reality, however, UNSC reform is likely still years away. The President probably calculated that making the grand diplomatic gesture of supporting Indian candidacy on the Security Council, while unlikely to happen anytime soon, would be the best way to dispel Indian skepticism toward his administration for earlier missteps on the Kashmir and outsourcing issues. Other measures that Obama unveiled, like easing of export control on Indian organisations and support for Indian membership in nonproliferation groupings like the Nuclear Suppliers Group and the Missile Technology Control Regime, are more likely to have a concrete and near-term impact on India's relationship with the global nonproliferation regime as well as its ability to fill its high-tech defense, nuclear and space requirements. These steps demonstrate in very concrete terms that Obama will carry forward the (George W) Bush legacy of incorporating India as a legitimate and responsible member of the global nonproliferation regime. There had been concerns in India early in the Obama administration that it would stall -- or even reverse -- progress made under Bush to steer the US bureaucracy away from the habit of viewing India as a target, rather than a partner, in stemming global proliferation. Obama's statement that India would now be treated the same as our closest allies and partners should lay to rest Indian concerns on this front. 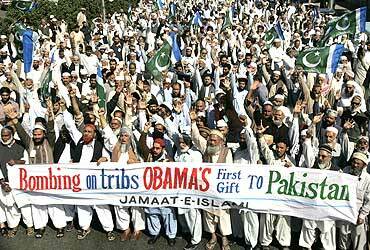 Obama's public statement to the Indian Parliament that Pakistan has to dismantle terrorist safe havens within its borders and bring to justice terrorists responsible for the Mumbai terror attacks probably warmed the hearts of Indians who always felt the US had double standards in the so-called war on terror. This statement, along with his endorsement of India in the Security Council, were home runs as far as the India polity were concerned? This statement, coupled with his other pronouncements on (Indian) Prime Minister (Manmohan) Singh's genuine commitment to establishing peace in the subcontinent, was tacit acknowledgement that the onus for moving peace talks forward is on Pakistan. Islamabad's failure to deliver swift justice against the perpetrators of the Mumbai attacks has been an enormous source of frustration, not only for New Delhi, but also for Washington. Administration officials have been reluctant to air their frustrations publicly over Pakistan's foot dragging on the Mumbai attack case because they receive cooperation from Pakistan on other terrorism cases and are loath to sacrifice these other lines of communication and cooperation with Pakistan. So, while New Delhi and Washington have differing priorities when its comes to engaging Pakistan, the two countries share the same principled stand against all forms of terrorism and view it as a threat to the democratic values they each hold dear. 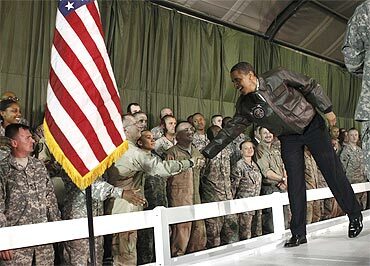 Obama did not even mention the K word (Kashmir), which Prime Minister Singh had no qualms about mentioning. He (Obama) threaded a very fine needle in his response to the media questions on Kashmir indicating that his administration would not seek to impose a solution on this dispute, while also noting the importance of Indo-Pakistani dialogue on the issue. Obama seems to have adopted a much more realistic viewpoint on the Kashmir imbroglio and accepted that there are limits to any US role on the issue. His pragmatic statements are likely to contribute more to establishing peace in the subcontinent than any attempt to bring a higher US profile on the issue. They will help encourage Kashmiris to think more realistically about a solution than can bring genuine improvement to their everyday lives. For all of the declarations of US support for India in the Security Council and in the nonproliferation regimes, etc, won't all of these simply fall by the wayside, particularly in US Congress, because Obama will have to be fully immersed in the domestic issues in the wake of the mid-term election drubbing his party received? If there is one foreign policy issue that enjoys broad bipartisan support, it is the effort to build stronger relations between the US and India. Republican leaders tend to focus more on the security implications for the US of a rising China, and thus see the logic of establishing strong relations with India as a way to meet these potential challenges. 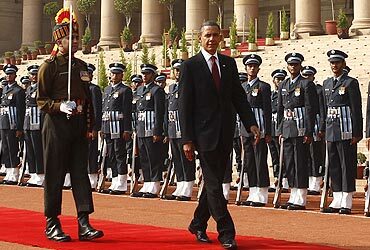 President Obama is likely to receive support from the Republican-controlled House of Representatives in implementing the initiatives related to bringing India into the nonproliferation regime and establishing stronger security ties, like curbing export controls and easing the transfer of high-technology to India. How about support for involving India in some form of a regional arrangement to garner support to resolve the situation in Afghanistan, which seems to be unraveling? India is concerned over Obama's withdrawal timetable. Leading Republicans have been critical of Obama's timeline for withdrawal in Afghanistan, which is also a position that the Indian security establishment shares. The Republican-led Congress is likely to push Obama to establish a more clear-cut strategy on Afghanistan that focuses on achieving US objectives and resourcing the counterinsurgency strategy that General (David) Petraeus is implementing. So, we are likely to hear more hearings in the House next year that focus on implementing a successful strategy in Afghanistan rather than questioning US military involvement in the region. 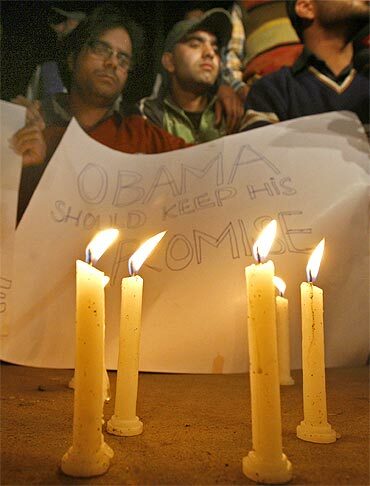 Has Obama's visit addressed India's core concerns?